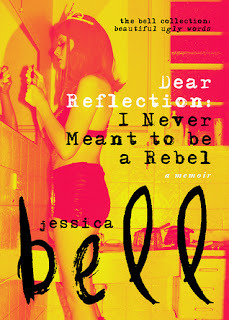 Home » other people's work » Review: "Dear Reflection: I Never Meant to be a Rebel (A Memoir)"
Review: "Dear Reflection: I Never Meant to be a Rebel (A Memoir)"
My review of Dear Reflection: I Never Meant to be a Rebel (A Memoir) by Jessica Bell. I don't normally read memoirs. They strike fear into my heart as potentially being Trojan horses for egomaniacs. Everyone has a story to tell, why should someone think theirs is of interest to others? Well, the answer is already there - we all have stories to tell. Whether fiction or not, there are patterns in lives, and there are experiences in common, and characters where we can identify feelings and behaviour and say, "Yes, I have felt that too." This is why we read. And that's why it was a pleasure to read this. Firstly, you can tell you are in safe hands. Jessica knows when we need detail, and when we don't; when the reader can be guided, and when the reader can be trusted; and that restraint was one of the things that first endeared me to the book. Jessica is an experienced author/creator, and this is far from her first work. As such it is well-written and polished. More than that, it is crafted with a fiction-writer's sensibilities. There is foreshadowing. There is repeated imagery. There is structure holding it together. There is an arc. If someone had never written a book before then I would not recommend that they tried a memoir, but in the hands of someone who understands the craft it can be as readable as any work of fiction. And it was readable. Some books are a chore to return to, but this was a joy, so I read it quickly whilst still savouring the obvious love of language in phrases like "my innocence still finding excuses to outshine my demons" and "I wore psychological earplugs like a nun wore her habit". I'm kicking myself for not marking a few that made me laugh, that were ripe for revisiting and rolling around in my mind. So if you like good writing, there's plenty to feast on here. The best books are a journey (physical or mental); and there is development, often maturation, for the main character. I was wrong to be suspicious of a memoir, because both of those important elements drive and shape this narrative. I'll admit it. I was won over. I genuinely enjoyed this, and I think you might, too.